Unknown Photographer, Sojourner Truth, 1864. I have included this image in both a survey of American art hstory and a global survey of art and visual culture at my college, but I think that it speaks more broadly to students of American history and literature. 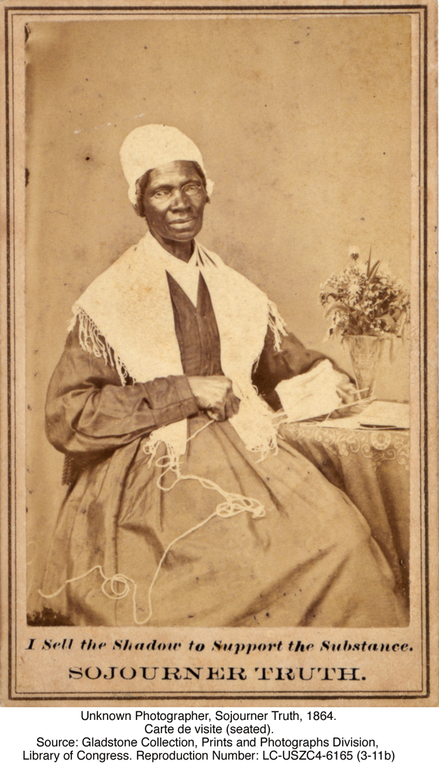 This is one of several portraits that Sojourner Truth sold to finance her speaking tours in the 1860s. The caption on the photograph reads, “I sell the shadow to support the substance.” Abolitionists used photographs to call attention to the plight of slaves and to raise money for the antislavery cause. A famous example of such photographs showed a “scourged back,” purportedly scarred by whipping. In selling her own image, Truth raised the stakes of this practice. She was able to do this because of the popularity of small portrait photographs in the early 1860s. The technology of making multiple copies of photographic portraits was very new at the time; earlier Americans had purchased daguerreotypes (an early form of photography where the image was captured on a copper plate with no negative so it was not reproducible) or prints, in the form of engravings or lithographs, copied from daguerreotypes. The spread of the glass plate negative and albumen print to the United States in 1859 inspired the collection of small portraits called “cartes-de-visite” (visiting cards) in albums, spurring the rise of a culture of celebrity. A noted abolitionist and woman suffrage activist, Truth had achieved recognizability long before this portrait was made. Born Isabella Baumfree, a slave, in upstate New York in 1797, she adopted the name Sojourner Truth when she became a Methodist minister in 1843. Within a decade she was traveling widely, lecturing against slavery, and in 1851 gave her famous speech, known as “Ain’t I a Woman?” at the Ohio Women’s Rights Convention. During the Civil War she worked to support the Union army, freedman’s relief organizations, and desegregation. It is tempting to look at this portrait of Truth as a reliable likeness of a notable woman. However, what strikes me each time I look at this photograph is the degree to which it has been staged. In Ohio, Truth called attention to her powerful arm, which could plow and plant as well as a man’s. But here she is presented as the epitome of middle-class femininity, in a neat gown and a demure white shawl and cap, posed next to a table bearing a vase of flowers. Her right hand, crippled in an accident decades before, holds the yarn for the half-knit stocking in her left one. After acquainting students with Truth’s biography, I ask them to think about the making of this image. How has she chosen to portray herself? What can we see of her accomplishments and ambitions in this picture? Can we see it as offering a sign of the limitations of the era as well as its achievements? What does the picture have to tell us about race, gender, and class? What do we make of the text below the image—what is involved in “selling the shadow”? More broadly, what does it have to tell us about a history of pictures? Can we imagine the beginnings of celebrity photography and what it might have meant to put this portrait, along with those of politicians, singers, “freaks ,” and family members, into an album holding a proud place in the family parlor? What does it tell us about the ways in which Americans imagined their homes and their national cultures? Teachers of literature might want to compare this image of an African-American woman with characters presented by Truth’s acquaintance Harriet Beecher Stowe in her 1852 antislavery novel Uncle Tom’s Cabin. Stowe’s article on Truth is cited below. Sojourner Truth, Narrative of Sojourner Truth: A Northern Slave (1850). Nell Irvin Painter, Sojourner Truth: A Life, A Symbol. New York: W. W. Norton & Co., 1996. Harriet Beecher Stowe, “Sojourner Truth, The Libyan Sibyl.” Atlantic Monthly 11 (April 1863): 473-481. Mary Niall Mitchell, “‘Rosebloom and Pure White,’ or so it Seemed.” American Quarterly 54:3 (2002): 369-410. Barbara McCandless, “The Portrait Studio and the Celebrity: Promoting the Art,” in Martha A. Sandweiss, ed., Photography in Nineteenth Century America (New York and Fort Worth: Amon Carter Museum of Western Art, 1991), 48-75.